Diavola is a pure-blood witch. She wields a 9¾" Hawthorn, Demiguise Hair wand, and is a member of the unsorted masses of Hogwarts students just off the train eagerly crowding around the Sorting Hat. Her favorite Harry Potter book is Harry Potter and the Deathly Hallows and her . Born in the city of Positano, Italy, Diavola was never normal. Her mother died at child birth and was left to be raised by her father, Diavolo. Her childhood was one of torture, $!#@, and hell, her father dragging her along wherever he went to do his job as the Devil's son and controller of the Italian kingdom of Hades. At the age of 18 she was smuggled away from her horrid life by her childhood friend Gem, taken to London to start afresh and live her own life. After years of roaming the streets of London with Gem by her side, she made many new friends along the way. Recently Dia has replaced her father and reigns as Queen of hell, her husband Frenzio by her side. She is thankful for the children she beared, her precious Selene and Sinister; and also found an adoring family when she was adopted by the wonderous and amazing pair of Tom and Ferva. Diavola has raven colored hair that flows half way down her back in waves, with crimson eyes to match it. Her skin is not pale, but has a slight tan look to it as she stands at 5'5". Her attire consists of a red corset, tied with black, silky lace and black satin shorts that go just below her bottom. Her knee high boots shine with their leather hide, a bowie knife hidden in one of them and a belt slashes across her waist with her sword, Meteor, attached to it. Her blade is made of black meteor and has a gold hilt, a gift from her dear friend Gem. When angered or threatened, she changes into her true form which is that of a demon with long, sharp horns; black, leathery and ragged wings; a long tail with an arrow at the tip; and razor sharp claws and fangs. 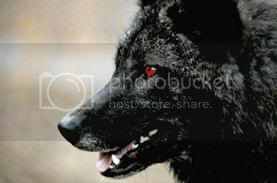 Diavola was gifted by her adopted father and posses the powers to change into a pure wolf with black fur. Personality wise, Diavola is easily angered with a mean bite. However, to those she cares about, she can be very sweet and loving. Don't cross her, are you will regret it.